Fujifilm announced the eleventh lens for their X-Series interchangeable mirrorless camera line. The new Fujinon XF10-24mm f/4 R OIS super-wide zoom will be the widest lens in the lineup, with a focal length equivalent to 15-36mm (35mm / full-frame equivalent). 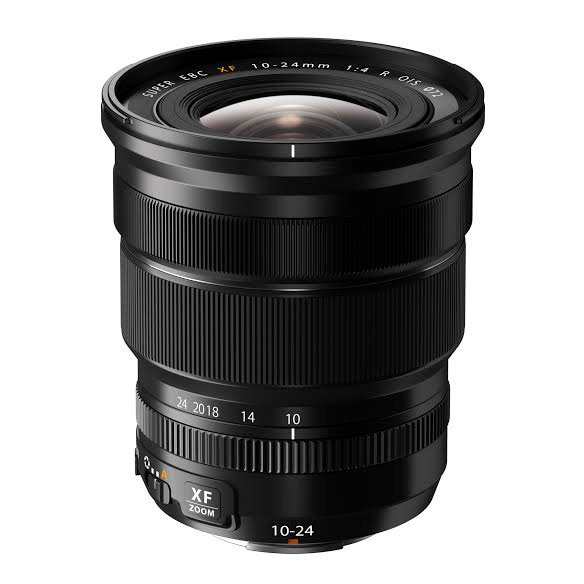 Right now, the widest lens for the X-Series cameras is the XF14mm f/2.8 R prime (17mm equivalent). The new XF10-24mm f/4 R OIS zoom will be a welcome addition for photographers who need real wide-angle coverage – especially working pros who need the quick convenience and versatility of a fast-aperture zoom lens. Fujifilm’s Fujinon lenses are well-respected for their excellent optics and have been for decades. In fact, the X-mount lenses are one more reason that Fujifilm’s X-Series mirrorless camera system is so good. One of the first things I noticed when I reviewed the Fujifilm X-E1 (Fujifilm X-E1 review) was that the 18-55mm “kit” lens was way better than any other 18-55mm zoom I’d ever used. There’s no reason to expect the new 10-24mm f/4 zoom will be anything less than top-shelf. It uses four aspherical elements and three ED elements as well as Fujifilm’s HT-EBC (High Transmittance Electron Beam Coating) multi-layer coating to ensure optical excellence. Furthermore, when it’s mounted on the new X-E2 camera body (Fujifilm X-E2 announcement), it will benefit from Fujifilm’s new Lens Modulation Optimizer (LMO) technology, which uses the camera’s image processing system to correct for diffraction and edge softness specific to that lens. The new Fujinon XF10-24mm f/4 zoom is a great addition to Fujifilm’s X-Series camera line, which is quickly becoming one of the best mirrorless system options there is. The 10-24mm f/4 zoom will be especially welcome for architectural, landscape and travel photographers who need truly wide-angle coverage. And the fast continuous f/4 aperture and OIS optical image stabilization will make the lens useable in nearly any lighting condition. The Fujifilm XF10-24mm f/4 R OIS zoom lens is compatible with all Fujifilm X-mount mirrorless camera bodies. It will be available in March, 2014 for a suggested retail price of US $999.95.